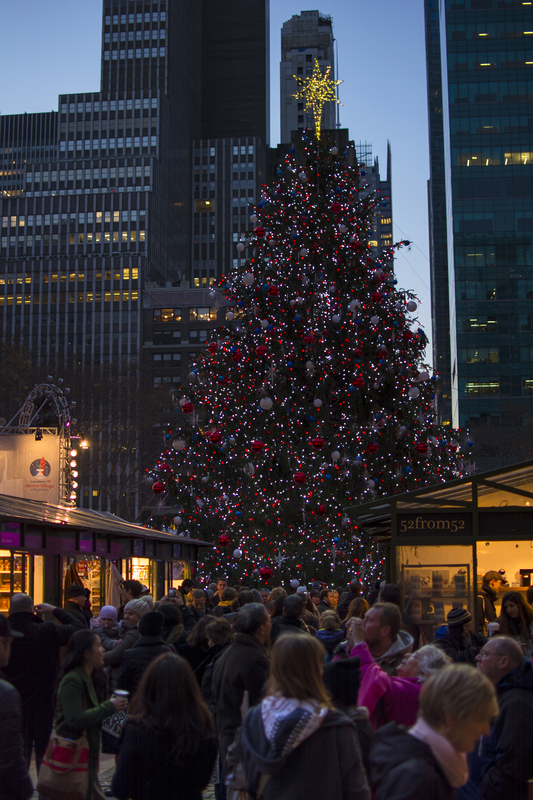 It’s hard to top New York City during the Holiday season. Everywhere you turn there are festive window displays, giant Christmas trees and glowing lights filling the night sky. If you’ve been reading my blog from the beginning you might remember my week 2 post, “A Day of Reflection” where I visited Bryant Park. As I said in week 2, Bryant Park is one of my favorite locations in New York City. One of the best things about Bryant Park is how it transforms throughout the year with each season. During the winter months the center grass area turns into an ice skating rink with a beautiful panoramic view of midtown New York. Surrounding the rink is a network of stores in in the form of tiny huts. As you can imagine this winter wonderland attracts visitors from all over. In case you didn’t guess by now Bryant Park is obviously where I got this week’s photo, but before I talk about my time in the park let me tell you how I ended up there. In the beginning of the week I wasn’t sure what to photograph so I threw out a status on Facebook to get some ideas. One of the suggestions I got was to capture the “hustle and bustle” of holiday shoppers, thanks Laura! After getting this suggestion Bryant Park and its “Winter Village” instantly came to mind. Since I pass the park during my commute to work I stopped in on the way home to scout for a good picture. After briefly walking around I found what I thought would be a great angle for a long exposure. The picture I had in mind would feature the Christmas tree centered between the store huts and shoppers in the foreground. 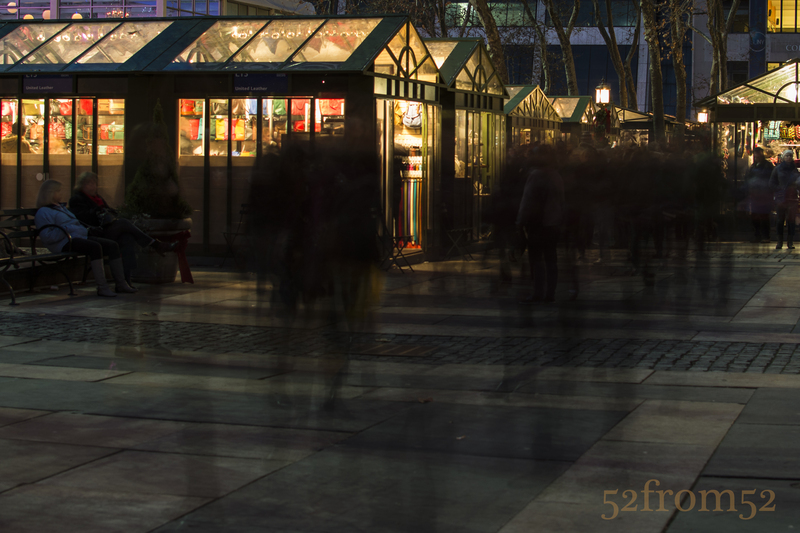 The reason I had a long exposure in mind was so I could get all of the shoppers in the foreground to blur as they moved around. With my picture planned there were only two more questions I needed answered, could I use a tripod in the park, and could I fit everything in the frame of my 35mm lens? I got one of my questions answered the next day after emailing the company that manages Bryant Park. The tripod was permitted; I just couldn’t use it on the ice, too bad right? The last question wouldn’t be answered until I got on location with my camera. This brings me to the day of the picture. Let me give you some advice, if you’re ever in New York City during December; don’t walk up 42nd street unless you want the full tourist experience. I usually avoid 42nd street but for some reason I decided to take it after getting out of port authority, bad move! I literally felt like I was an extra in the Walking Dead. The streets were so packed that you couldn’t move any faster than at a zombie pace. I fought through the crowd thinking it’s okay I’ll have space once I get to the park, wrong. When I finally got to the park I was greeted with an even larger crowd than was on 42nd street. I knew this might be a problem for my picture but I remained optimistic until I got to my spot. Once I fought my way to my planned location it was time to answer my last question, will everything fit in frame…and the answer was no. As you can imagine this was very disappointing, but I couldn’t give up so I starting thinking how I could still get this picture but from another angle? I started walking around, and then while I was standing in front of the tree it hit me. Just like in my last visit to Bryant Park, why not use a reflection to capture my subject? 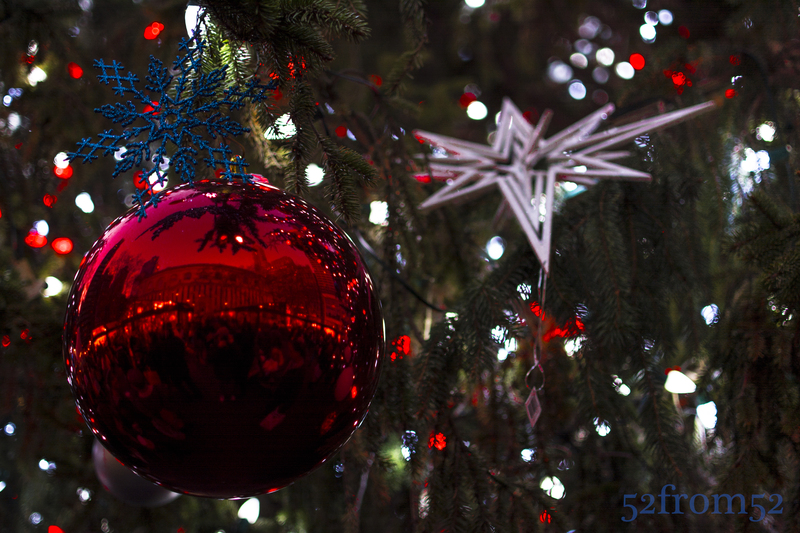 Look closely at the Christmas ball and you’ll see the reverse angle of my original picture. Now it’s your turn, try to capture a creative reflection shot! When you do use the hashtag #52from52_wk18 and post it on Instagram. There wasn’t really anything tricky about capturing this picture from a photography technique standpoint. This week’s picture was made mostly via creativity which is less of a concept and more of an attribute that each individual photographer possesses. This is why I threw out the challenge for people to take their own reflection shots, I’d like to see them and see how your creativity is displayed. All that being said even though this week’s picture wasn’t too technical I can still briefly talk about the picture I was originally going to take and some of the lessons I learned. Above is picture from the position I originally planned to take a this week’s photograph from. As you can see it took a portrait composition to capture the tree and the crowd in one frame. I could have taken two pictures and stitched them together via photoshop (definitely a future blog subject) but I didn’t know if that would work well with a long exposure. I also could have tried to get my long exposure from this portrait composition but I wasn’t happy with the way the stores were getting cut off. There was also one more issue with my long exposure idea that I didn’t learn until after the fact. Dealing with a crowd of this density doesn’t really provide the look I was going for when using a long exposure. Of the pictures I did take via long exposure, I learned that at 30 seconds the crowd disappeared and just blotched out the area they were standing in. Even when I took shorter exposures (4-10 seconds) the crowd’s density still didn’t allow you to clearly see these were people I was photographing. Below is an example of a 5 second exposure . This concept of using long exposures to capture the movement of people is something I’m going to experiment with more in the future so stay tuned. What a busy week! Lucky walking, or running, around Hoboken always seems to provide interesting pictures when I don’t have the time to plan something. This week my goal was to try and get a picture related to the fall or Halloween. With a crammed schedule all I could do was hope that something would present itself, and it did! Normally I run along the water in Hoboken but on Thursday I decided to change it up and run down Bloomfield St. since lately there seemed to be this orange glow emitting from the street. Much to my surprise the people in Hoboken are really into decorating for Halloween. Most of the houses lining Bloomfield had at least some interlaced webbing along their stoop, if not a full out Halloween scene. Running down the street was almost like going through a haunted house since there were witches, ghosts and spiders littered all over. Along my path I even stumbled upon a news crew camped out around one of the more creative houses. The news crew was likely talking about how intense and competitive decorating for Halloween gets in Hoboken. There were so many houses I could have chosen but the one that caught my eye featured a string of jack-o-lanterns that seemed to be smiling at me. After finding my subject I ran, literally, back to my apartment to grab my camera (no I didn’t run with it!) and went back out to get my shot. Like in my other night pictures the biggest challenge was dealing with the low amount of light. My subject (the jack-o-lanterns) were nice enough to emit a good amount of orange glowing which enabled me to drop my ISO. Hopefully by now you know what ISO is and how it’s related to light, if not circle back and read either my week 3 or week 4 blog. Back to ISO, thanks to the light coming from the lanterns I could shoot my picture with an ISO of 800. I probably could have gone lower but I didn’t want to creep in front of some persons house for too long. Using the lower ISO left my picture looking crisp rather than grainy as is usually the result from a higher ISO. The other aspect of the “triangle of photography” which helped shape my picture was the aperture that I used. In this picture my aperture was f/2 which is part of why I was able to shoot with a low ISO. f/2 is one of the largest apertures you can use and lets in a lot of light. One of the results from using wider apertures is the background blur caused by a shallow plane of focus that I’ve talked about in past blogs. Having a shallow plane of focus is why you can clearly (or not so clearly) see the pumpkins gradually get more and more blurry as they move further away. The last thing I want to point out about this picture is how I lined it up. It’s often tempting to take a picture head on but I highly encourage you to try to find a unique angle that perhaps you wouldn’t see while walking around. 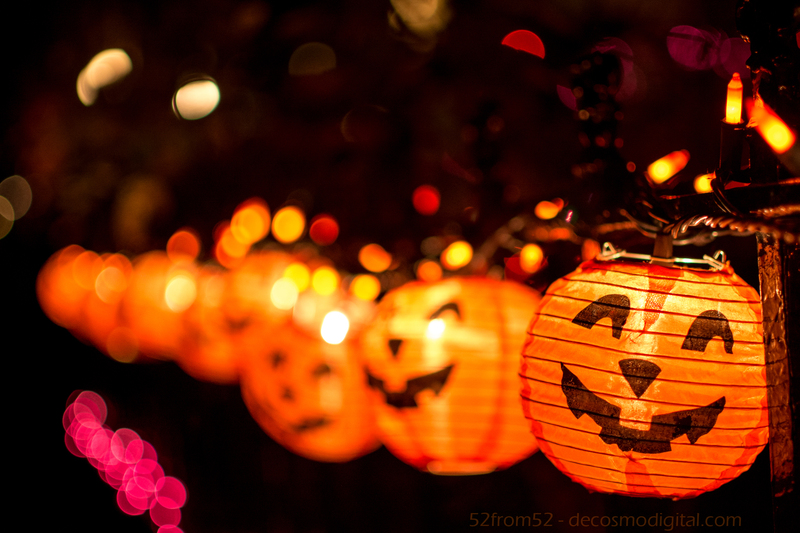 Not too many people would bend down and look straight down the line of jack-o-lanterns. Anyone passing by might stop and look at the lanterns head on, this is why finding a unique angle is way more interesting. Get low, get high (legally), and find that unique angle!